Why do you have to go buy a mountain cabin when you can just rent or even borrow it the one time a year you go to the mountains? Ownership isn’t the only way to enjoy it. “It is better to be satisfied with what you have than to be always wanting something else” (Ecclesiastes 6:9 GNT). The first step in becoming a contented person is to stop comparing yourself to others. The problem is that comparing is America’s favorite indoor sport! We naturally do it all the time. You walk into somebody’s house, and the first thing you do is make comparisons: “I like that floor! Look at that drapery! Wow, what a television!” You walk past somebody and think, “I like the way she did her hair; mine looks terrible today.” You are constantly comparing, and it keeps you frustrated. You’ve got to stop it! If you’re going to learn contentment, you’ve got to stop comparing your life to everyone else’s. You also must learn to admire without having to acquire. You need to learn to rejoice in other people’s prosperity without getting jealous and envious and feeling like you have to have it, too. This is one of the great principles that Americans don’t understand. You don’t have to own it to enjoy it! Maybe you like to vacation in the mountains. Why do you have to go buy a mountain cabin when you can just rent or even borrow it the one time a year you go to the mountains? Ownership isn’t the only way to enjoy it. 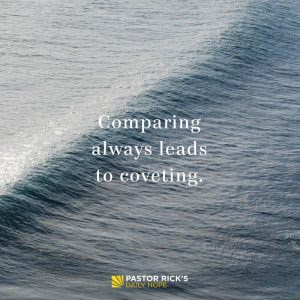 It’s not just a good idea to stop comparing; it’s a commandment. Exodus 20:17 says, “You shall not covet . 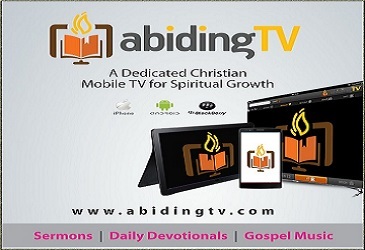 . . anything that belongs to your neighbor” (NIV). Coveting means the uncontrolled desire to acquire. It’s such an important sin to avoid that it’s included in the Ten Commandments. The word “covet” in Greek means “to grab or to grasp so tightly that your hands are tight; you can’t even let it go.” If God ever gives you something and he tells you to give it away and you can’t, you don’t own it — it owns you. God is not saying you should never have a desire for something. That’s not Christianity; that’s Buddhism. Desires are not wrong. In fact, your desires come from God. But when a desire is uncontrolled, it becomes coveting. When you desire something that is not yours, that’s evil. But a desire is not a negative thing. Nothing can be accomplished unless you desire to do it. You can’t become more like Christ without desiring to become more like Christ. For instance, you can’t be a more loving person without desiring to be a more loving person. You can’t be a more generous person without desiring to be a more generous person. Desire is not bad until it is uncontrolled and you think you’ve got to have more, more, more. The root of that kind of desire is in comparing yourself to others. You can’t have a contented life until you learn not to compare. Why should you never compare? Because comparing always leads to coveting. How might you change your perspective about your own possessions so that you can rejoice with others over their possessions? What do you think God wants you to fill your life with instead of possessions? Christians talk a lot about God giving them the desires of their heart. What kind of desires do you think God wants to give you?